Melissa Foster writes sweet and emotional romances so well and CRASHING INTO LOVE is just that: sweet and emotional. Fiona Steele has a good life, a successful career and everything anyone would want except one thing: love. And not just anyone’s love. She wants the only man she has ever loved, her high school sweetheart Jake Braden whose heart she broke when she left him behind to go to college. It’s been over fifteen years but Fiona never got over him and when the opportunity presents itself, she takes a leave of absence from her job and sets off to win Jake back. And Jake. Jake wants what his siblings have: loving relationships with their partners but after being badly hurt by Fiona, he closed himself off even though he was down for getting it on with as many females as made themselves available. With his career as a movie stuntman, willing females are always available. I have to say that Fiona was bold and tenacious. She took a huge risk and just kept at it even when Jake was not receptive to talking to her. She completely opened herself to a world of hurt when she could have cut her losses and moved on after the first couple of rejections. And it paid off for her. She got her man back! I love that Ms. Foster kept the angst and drama to a minimum and instead focused on how Jake and Fiona worked on re-building their relationship. Jake had buried his feelings for Fiona so deep and was understandably reluctant to revisit the past with Fiona, but when he allowed himself to remember, he was all in and from then on it was about connecting with her again and making sure that his lifestyle in no way affected what he had with her. 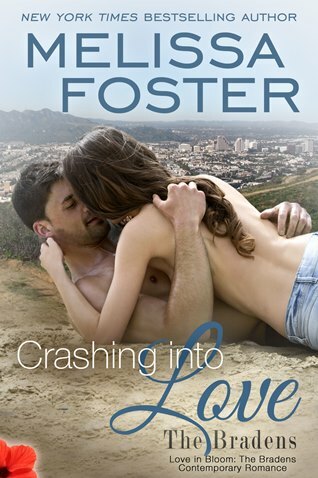 CRASHING INTO LOVE is an amazing story about a second chance at love and is actually my favorite of the series so far. Melissa Foster is a New York Times & USA Today bestselling and award-winning author. She writes contemporary romance, new adult, contemporary women’s fiction, suspense, and historical fiction with emotionally compelling characters that stay with you long after you turn the last page. Her books have been recommended by USA Today’s book blog, Hagerstown Magazine, The Patriot, and several other print venues. She is the founder of the World Literary Café and Fostering Success. When she’s not writing, Melissa helps authors navigate the publishing industry through her author training programs on Fostering Success. Melissa has been published in Calgary’s Child Magazine, the Huffington Post, and Women Business Owners magazine. Thank you for hosting CRASHING INTO LOVE today!